The first thing you’ll need to do is set up a script and cron job so that theoretically, the backup will happen inside linux. I’m using Ubuntu 16.04 at the moment, so the stuff below may need to change a bit if you’re using another flavor of linux on Win 10. Save the installed packages to the file /root/packages.txt so that if WSL gets hosed, you’ll remember what you need to reinstall. Grrrrrreat… That just runs your backup script as root every morning at 5am. All set, right? Not so fast! So, you might think that you’re done, but you’d be wrong. It appears that at the time of writing anyway, Microsoft “doesn’t allow” background linux tasks. You can use Task Scheduler and run a bash command with 75,000 crazy parameters from the Windows’ side of things, and apparently that works. But holy cow, it’s crazy. You see, the problem is that if you close your WSL window, it’s like shutting down linux. So, no cron jobs. 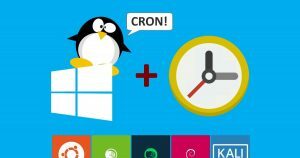 Now, every time you fire up Ubuntu on Bash on Windows on Puter on Earth, the cron service will be automatically started. As long as you leave the bash window open, your cron job(s) will run nicely. So, adjust your backup (or whatever) times accordingly. If you shut down your puter at night, for example, you could just run the backup script once every hour. While you work, the backup will run. It seems that while you can find the linux system’s files in your Users folder, this is not recommended. In fact, the location seems to have changed yet again. The reason for this is that modifying any of those linuxy files from Win 10 apparently causes things to break nicely on the linux end of things. So, if you need a backup, make a compressed archive in linux, and dump that archive onto the Windows file system. DONE! ← What you can do about 5G, WiFi, etc. One interesting improvement I have found is to create a VBS script that I launch when Windows starts (for instance by storing it under shell:startup). This scripts launches an invisible bash session which in turn launches the cron service. An since it’s invisible, you are less likely to kill it by mistake. This means you can close all visible bash windows and it will still run in the background, leaving cron jobs operational. You can always kill it in task manager if needed. That looks WAY simpler than the other examples I found for the “background bash” method. Thanks!